Cash cube hire, this is one of our most popular pieces of equipment. Our cash cube hire in London to the parties and exhibition sector is as busy now as when these grab a grand machines first came out. The cash cube is a great fun game, the great thing is you can set the length of time players are in the cash cube – normally 30 seconds, so you will get through a large number of players. The cash cube players go inside the transparent unit and then the blower starts, the aim is to grab as much fun money or tickets as you can and put them in the deposit box. After the time has finished the alarm (adjustable volume) goes off and the lights flash. The deposit box is emptied and the winner is the person with the most money. With the ”cash cube hire” you can place ‘golden’ tickets in throughout the day so give out your top prizes at the rate you want. The cash cube was made famous by the television show ‘The Crystal Maze’. 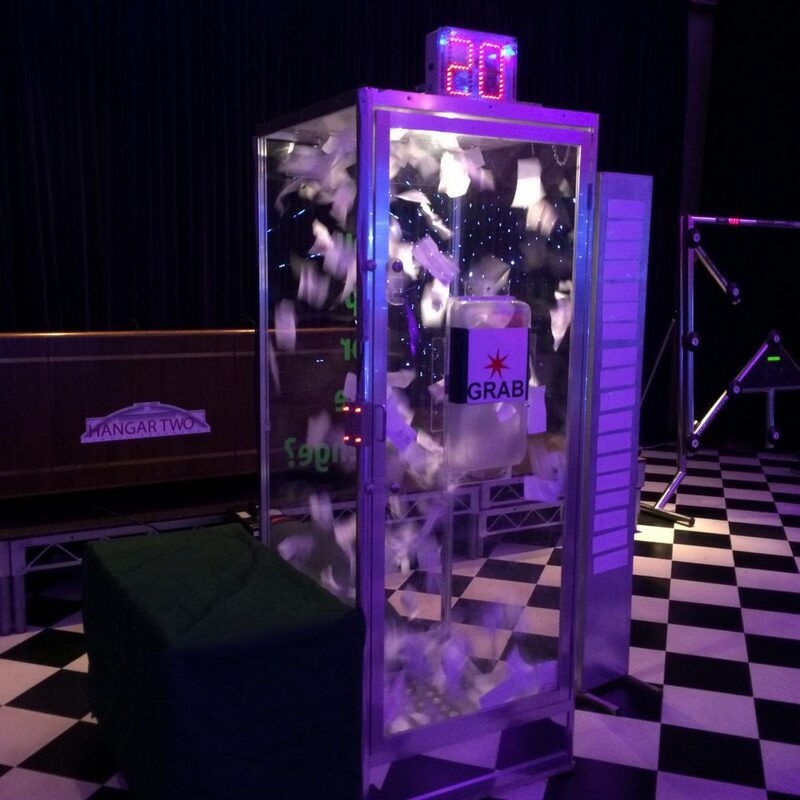 Cash cubes are great, the money booth hire is simple, grab as many notes as you can in thirty seconds. The grab a grand machine hire is a great attraction at exhibitions. Our grab a grand hire has been on television and at many promotions. The cash cubes hire is great for prize giveaways also, just add in a ‘golden ticket’. The cash cubes for hire are available throughout Europe. Our cash cube for hire have been to exhibitions in Barcelona, Vienna and Monte Carlo. We hire cash cube fun throughout the UK as well. Hire grab a grand machine for a great fun promotion. The grab a grand machine is great as a centrepiece on stage for giving away great prizes. The cash cube game is one of our most popular hire items. The grab a grand game is a great cash cube promotion, basically just a money blowing machine. We hire cash cubes throughout the UK but are probably one of Londons busiest hire companies with the amount of products and entertainers we have. The cash cube is great for promotions and exhibitions and you can brand the machines with company logos. They are also very visual as you can see the players from all side. We also have all the other great exhibition games like the arcade grabber and the Batak wall. The cash cube is great fun at parties and can be used by children and adults. As one of Londons most established entertainment agencies we have the perfect acts and equipment for your next event. Cash cube hire is great for promotions.